Fundraising news - £869.23 raised so far! In January, we embarked on a fundraising drive and our first event was a quiz night and raffle. It was a great evening and thank you to all the teams who came, to the Brunswick pub for letting us use their room and to the businesses who supported us with raffle prizes: Royal Pavilion, BoHo Gelato, Waitrose, Brighton Body and Brain, Montezumas, Duke of Yorks’, Komedia, Theatre Royal. 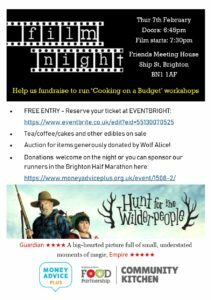 In February we had a free film night with delicious cakes made by members of staff and watched the heartwarming film Hunt for the Wilderpeople. Thank you to everyone who came and and made generous donations. 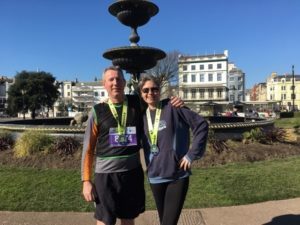 Later in February, members of staff Carly and Nick ran for us in the Sussex Beacon Half Marathon. It was an absolutely glorious day as you can see from the photo. We are so grateful to everyone who contributed and to members of staff who volunteered their time, energy and enthusiasm to make this all work.